June 30, 2016 – On June 30, just in time for the global celebration known as Asteroid Day, NASA’s Dawn spacecraft completes its primary mission. The mission exceeded all expectations originally set for its exploration of protoplanet Vesta and dwarf planet Ceres. 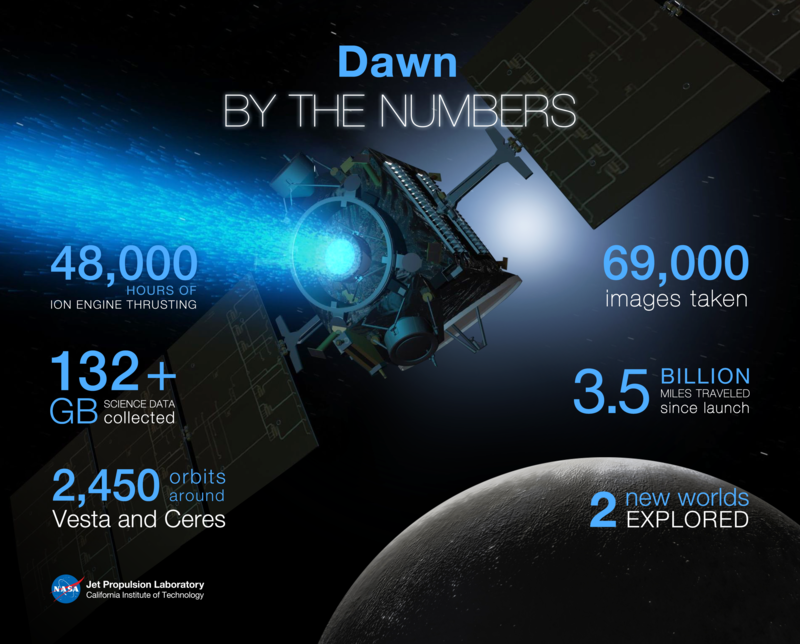 The info graphic above highlights some of the accomplishments of Dawn’s journey since launching in September 2007. Dawn has traveled 3.5 billion miles (5.6 billion kilometers) since launch, and has made 2,450 orbits around Vesta and Ceres. The spacecraft has returned about 69,000 images, combined, of both bodies. Dawn’s mission is managed by NASA’s Jet Propulsion Laboratory, Pasadena, California, for NASA’s Science Mission Directorate in Washington. Dawn is a project of the directorate’s Discovery Program, managed by NASA’s Marshall Space Flight Center in Huntsville, Alabama. UCLA is responsible for overall Dawn mission science. Orbital ATK Inc., in Dulles, Virginia, designed and built the spacecraft. The German Aerospace Center, Max Planck Institute for Solar System Research, Italian Space Agency and Italian National Astrophysical Institute are international partners on the mission team.